If you're hoping to have an iPhone 6 Plus on September 19, your best option now is to wait in line at your local Apple Store or cell service provider store because Apple has sold out of its pre-order inventory only hours after starting orders. The smaller screen iPhone 6 is still available for next Friday delivery instead of the week or longer wait iPhone 6 Plus buyers are now facing. Apple unveiled both new iPhone models during a special media event earlier this week with the promise they'd be available for pre-order on Friday and available in stores next Friday, September 19. The company's online store was replaced with a "We'll be back" message before midnight, and was unavailable for several hours into Friday morning. Most of the iPhone 6 Plus models sold were likely processed through the company's Apple Store app on the iPhone and iPad since it tended to successfully complete the order process even while the Web-based store was offline. The iPhone 6 and iPhone 6 Plus were introduced earlier this week at a special media event. The iPhone 6 comes with a 4.7-inch display, and the iPhone 6 Plus sports a 5.5-inch display. Both include Apple's own A8 processor and M8 motion co-processor, better graphics performance, 802.11ac WiFi, NFC, 8MP camera with improved image sensor, thinner bodies compared to the iPhone 5S, improved battery life, and more. Pricing for the iPhone 6 Plus starts at US$299 for the 16GB model. The 64GB version costs $399, and the 128GB version is $499. 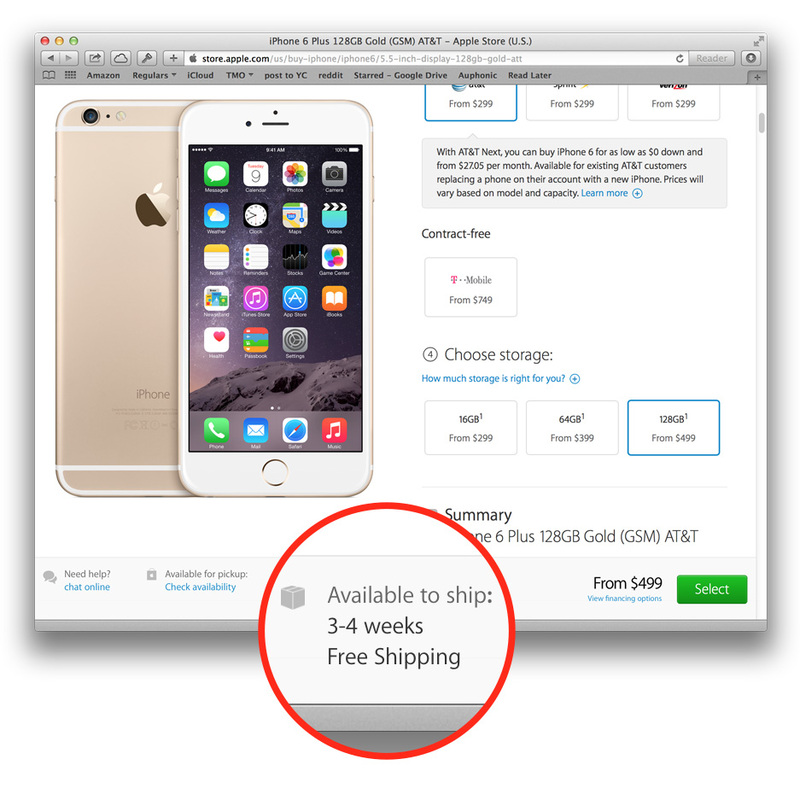 Currently, the 16GB, 64GB, and 128GB iPhone 6 Plus in white/silver or space gray are showing as available in seven to ten days, while the white/gold version is showing a three to four week ship time for all capacites.